Supporters hope Initiative 940 will change Washington state policy so fatal police shootings happen less often and so there’s more accountability when they occur. 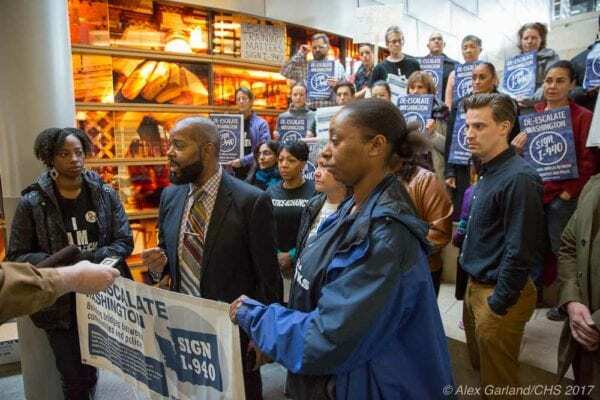 Gathering on a few Seattle City Hall steps Friday, a crowd representing 33 different families impacted by police killings gathered in support of I-940 in the hopes of preventing future deaths. The Puget Sound region witnessed a slew of police killings in the past year: Renee Davis Oct. 21, 2016, Jacqueline Salyers on Jan. 28, Daniel Covarrubias in April, Tommy Le June 13, Charleena Lyles June 18, Giovonn Joseph-McDade June 24. All of them were people of color. Salyers, Davis and Lyles were all pregnant when killed. I-940 aims to hold police accountable for violent actions. The initiative, changing the malice standard for and self-investigation by police, stems from Che Taylor’s fatal shooting from February last year. Earlier this week, The Seattle Times reported the conclusions of an official review that showed the officers actions were within department policy when the 30-year-old Lyles was shot to death. SPD officers Steven McNew and Jason Anderson shot Lyles seven times at her apartment on June 18 while responding to a burglary call. Johnson said the family is “beyond devastated” but not surprised. “If her death is within policy, policy needs to change,” she said. I-940 would require and change a number of police practices and standards. It calls for police to have de-escalation, first aid and mental health training. Officers must also provide first aid at the scene under certain circumstances. I-940 would establish a good faith standard for the use of deadly force and requires a completely independent investigation when it results in death or injury. The initiative requires tribal involvement in investigations if a tribal member is killed or injured. The language mandates community involvement in policy for police curriculum, training hours, guidelines for rendering first aid and procedures for independent investigations. Since 2005, police killings in Washington have risen dramatically but only one officer has ever been criminally charged, according to The Seattle Times. That is the only fatal police case brought forward in a Washington court for over 30 years. All of this requires probable cause that a suspect, if not apprehended, poses a threat of serious physical harm to an officer or others. Johnson, Lyles’ cousin, has been at the forefront of public discussion on behalf of her family. Lyles’ four kids, who were split up for a short amount of time following her death, still live with family. But they will never get to meet Lyles’ fifth child who died with her as she got shot. Sonia Joseph, Joseph-McDade’s mother, shares Johnson’s painful experience. Joseph-McDade was shot multiple times as a police officer felt Joseph-McDade was going to run him over. As it stands, I-940 has 230,000 signatures but needs 30,000 more to make it onto the ballot. The De-Escalate Washington campaign in charge of I-940, in joint with Not This Time, raised over $8,000. Per their own polling, 75 percent of voters say they would vote yes on I-940. Andre Taylor advocated for this piece of legislation on behalf of his brother, Che Taylor, who was shot by police. The King County prosecuting attorney’s office denied Johnson’s account of the conversation. The inquest is set for April. I-940 has until Dec. 29 to get the number of signatures they need for the November 2018 ballot.